Do you want to know more about myHabiteo ? Our team will come back to you with all the answers to your questions. myHabiteo or how executive management, marketing and sales services have their activities fully transformed ? 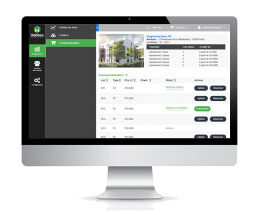 myHabiteo is an innovative platform designed for new real estate actors. It allows to create a link between marketing and sales activities and gathers crucial informations to give visibility to all the people connected. What I'm going to find in myHabiteo ?